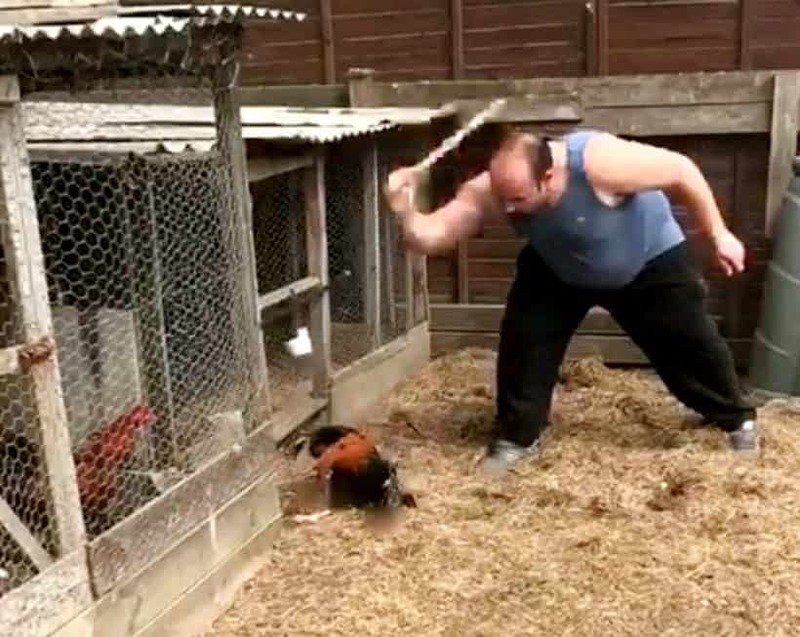 A man has been jailed after police found a video of him viciously beating a cockerel to death – with a metal kebab skewer. The sick footage shows him holding the bird upside-down and beating his head “like a piñata” said and RSPCA boss. Jimmy Goddard, 27, was jailed on Thursday after officer found the footage on his phone while investigating an unrelated matter. The footage showed the man, wearing a blue vest, chasing a cockerel around a fenced area with a metal pole. RSPCA Chief Inspector Will Mitchell described the violent footage: “Mr Goddard chases the bird around taking swipes with the 3ft-long metal skewer like a baseball bat. “He swings at the poor bird again and again, hitting him in the head like a pinata. He then throws the bird’s body onto the ground and celebrates the vicious kill. Goddard was sentenced to an eighteen week custodial sentence by the court and disqualified from keeping any animal for five years. He also had to pay £750 and victim surcharge of £115. Goddard of Mayles Close in Wickham, Fareham, appeared at Southampton Magistrates’ Court on Thursday (14 March) for sentencing. He was sentenced to 18 weeks in prison and banned from keeping animals. In August 2018 he was found guilty in his absence of one offence of causing unnecessary suffering to the bird but he failed to attend court so a warrant was issued for his arrest.